Successful politicians and good brands have much in common. Consider for a moment how Acura’s video commercial made a mark in the blogosphere, one that caused scores of keyboards and social media posts to go favorably wagging. “The [Acura automotive] ad is buoyed by Motörhead’s rendition of the Rolling Stone’s classic, Sympathy for the Devil, as the auto does its best sportscar-style moves,” said The Drum. Every successful professional or politico knows the value of good social and mainstream media. But something must happen to grab that spotlight. On Friday, Team Warren kicked the hornet’s nest of big business. Which means that her fight is now on. What every business, person, or politicians needs is energy. That Acura commercial – it has energy. The Warren campaign arguably just lifted their energy level. Wittingly or not, for good or ill, there is no doubt that Senator Elizabeth Warren (MA-D) has several touch-points with manufactured housing professional interests. Some in MHVille cheer her, while others jeer. But that too has potential energizing value for a firebrand like Warren. As her hoped for GOP counterpart in the Oval Office has demonstrated, one can rise in the polls, even when controversial. Sometimes, one rises in the polls, especially when a person or organization are shaking things up. On MHProNews’ Masthead editorial blog, let’s note for new readers that Senator Warren – the long-shot for the 2020 Democratic nominee for president – has addressed groups that included MHAction. She was a driving force behind Dodd-Frank and the creation of the Consumer Financial Protection Bureau (CFPB). Those won’t earn her fan mail from several quarters. We hope to engage with their campaign on those issues. That said, let’s now turn to the plus column. Friday, the Warren campaign’s emailed statement to MHProNews stressed her emphasis on antitrust legislation. Of course that campaign plank will cause shivers for some, but may draw curious smiles from others who are small- to mid-sized business professionals. Warren’s strongly stated antitrust stance ought to have Republicans, President Donald J. Trump, independents, and her fellow Democrats pondering the 22 million who live in a pre-HUD Code mobile home, or a post June 15, 1976 manufactured home. Why? How might that target audience swing in the 2020 nomination battle? Will breaking up mega-corporations play well during table talk at the community clubhouse? Or consider the larger-still potential voting block of renters. They are over 100 million living in rentals, said CityLabs in 2018. The vast majority of renters, per the National Association of Realtors ™ (NAR), want to be homeowners. 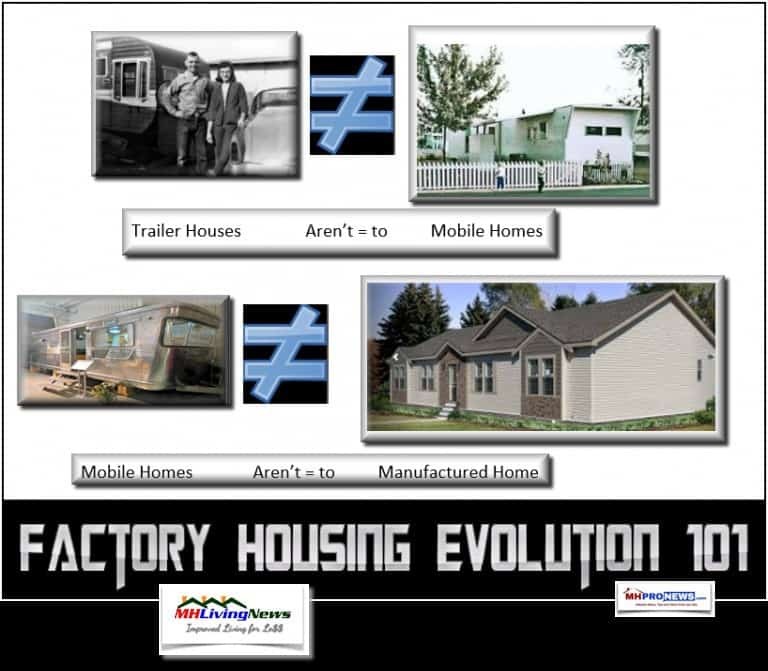 NAR’s Scholastica ‘Gay’ Cororaton, CBE, did research that praised manufactured homes in 2018. 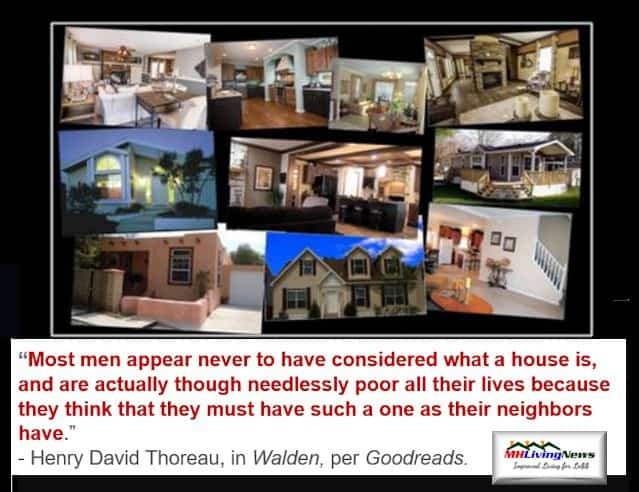 Cororaton noted in her research that millions of renters pay the same or more monthly as what it would cost them to live in a manufactured home. She also debunked several of the quality concerns, noting that was true of pre-HUD Code mobile homes, not post HUD Code manufactured homes. Here’s how she phrased it. Recall, that Cororaton thoughtfully cited moi and the Manufactured Housing Association for Regulatory Reform‘s (MHARR) Mark Weiss, JD, in her through research’s first footnote, on page 48. Renters and manufactured home owners are in a very real sense aspirational audiences that any savvy candidate should desire. In August of 2016, an op-ed in the New York Times noted that the “Downwardly Mobile for Trump.” That column cited a survey that revealed “Support for Mr. Trump wasn’t strongly related to income and employment.” That included the residents of mobile and manufactured homes, per the NY Times and others. Curious about that claim, MHProNews did an unscientific survey of campaign signs and bumper stickers in a four star manufactured home community as Election Day 2016 approached. Our informal research confirmed the NY Times claim. 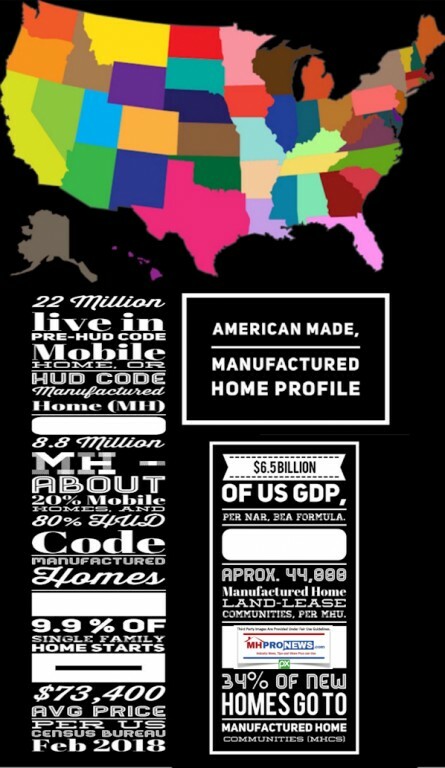 The clear edge among manufactured home owners favored then GOP candidate Mr. Trump over Democratic nominee Secretary Hillary Clinton. Why Does this Matter to MHVille Now? The 2020 campaign has been in full swing for months. It will only get hotter. With a crowded field, and with the first debates ahead, the contenders must differentiate themselves. Voters and donors must make early choices. What follows are the 3 key words from the Warren Campaign email yesterday. It will be followed by her campaign’s pitch. For those that know our editorial views, you won’t be surprised when we smile while sharing these 3 bullets from the Warren camp. Senator Warren isn’t just taking about regulating big companies, she wants to break the giant conglomerates up. On her 3 bullets, 3 cheers. As you read the sections of their statements that will follow, ponder this fact. Your Masthead writer shared a pair of links – one of which is below, that the Warren campaign – which renounced major donors – received with enthusiastic thanks and interest. As veteran readers on MHProNews know, you can access the report by clicking the hot-linked text-image box below. Rephrased, there are pragmatic strategic reasons why the Warren’s campaign may want to publicly lash out at a billionaire who’s first name matches her last. There are likewise strategic reasons why if Warren did so publicly, there are numbers of independent manufactured housing professionals that could find her the more appealing Democratic candidate in their bid to recapture the Oval Office. Because those independents don’t want to be treated as the de facto serfs of Warren Buffett’s growing empire. Here are just two screen captures from the Twitter feed of Austin Frerick, of the Open Markets Institute (OMI). Warren Buffett’s monopolistic tendencies in manufactured housing have sparked years of controversy that the Seattle Times, BuzzFeed, Representative Maxine Waters (CA-D), the Open Market’s Austin Freric (see graphics, above and below), GuruFocus, the Nation, Democracy Now, and others. They’ve found Clayton Homes and their problematic record on race, business practices, and lending worthy of their respective ire. Recall how Clayton’s home town media put it in 2018? See the reminder, below. What better way for Senator Warren to grab headlines, and the potential interests of millions in the misunderstood and under-appreciated groups noted above, than to go after the third richest man in America? Namely, Warren Buffett? What better way for her to set herself apart from the crowd than to use the facts we’ve shared with her campaign, to highlight Buffett and his minions in Knoxville and Arlington, VA for their purportedly harmful monopolistic Moat? Weeks before Warren made her announcement on Friday, MHLivingNews spotlighted Senator Warren’s speech to the antitrust-minded Open Markets crowd. It may be one of the best cases yet on how existing laws can be applied to go after the giant conglomerates. That’s why we published it with some related commentary. Her thesis is that there is no need for years of waiting for new legislation. Warren says that the laws on the books are all that is needed for immediate action. Can Warren and MHVille Democrats, Plus Others Connect? Strategically, one can make the argument that this fits Senator Warren’s needs. It also fits that 50 percent of the manufactured home industry – with far more people – could find reason to support someone like her if she will publicly oppose Buffett’s brands demonstrable take over of the most proven part of the affordable housing industry, through purported market manipulation via Moat building “Conquest Capitalism.” © Depending on how the discussions go with team Warren, MHProNews just might give Senator Warren’s campaign the green light to use that phrase “Conquest Capitalism” in her campaign. With a wink, ICYMI, here is the report on that topic, accessed via the hot-linked text image box, below. As a political independent, we make no secret about the fact that we supported President Trump in 2016. 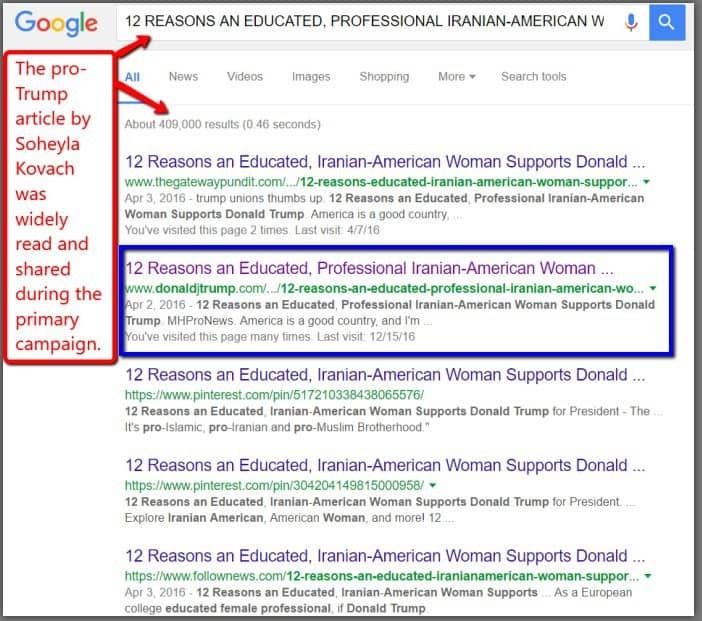 His campaign thought so highly of the support by my Persian princess, Soheyla Kovach, that they placed her pro-Trump column on their campaign website. Soheyla’s endorsement remained there until the Trump site was redone, after the 2016 election. No doubt Soheyla checked off several useful boxes for Team Trump. While it is anyone’s guess how many read it there on the Trump campaign site, what is better known is that thousands of other sites picked it up, per search results. Those remained active, or Google wouldn’t have registered it. These are details the Warren camp, other campaigns, and manufactured housing professionals from coast-to-coast should ponder. Even Republicans and libertarians should consider what follows carefully. Why? Because Elizabeth Warren – with who’s campaign we’ve made clear that there are stances she holds that we disagree with – is arguably dead right about the over-arching power of Big Tech and other monopolies. That’s another issue that long-standing MHProNews readers know we share. That’s another cheer. Here’s a blast from the cited past. Compare what Scott Galloway, of New York Stern, said about what he called the Big Four in tech. Good policy is not partisan. What Galloway said in this previously cited quote, finds echoes in what the Warren Campaign said below. Even Fox News’ Tucker Carlson Friday night loudly sang Senator Warren’s praises on this specific antitrust announcement. Yes, he reminded his readers that he sees other topics differently, just as we are doing herein. With that lengthy background, let’s turn to how Elizabeth Warren has kicked the hornets nest so effectively, that it has set the media across the left-right spectrum abuzz. There’s energy. Think about all the time you spend on the internet — checking the news, shopping, catching up with old friends, reading emails like this one. Well, more and more of the things we do online are being controlled by a smaller and smaller group of giant corporations. They’ve mastered a very powerful business model: Monopolize their platform and force other companies, media platforms, and publishers out of business. If you buy something online, there’s a nearly 50% chance that you’re going through Amazon. If you go to any website, there’s more than a 70% chance that it’s owned or run by Google or Facebook. America’s biggest tech companies are controlling more and more of our digital lives. Here’s why tech companies with nearly unfettered power aren’t a good thing: They buy potential rivals, like Facebook did with Instagram and WhatsApp, limiting innovation and choice. They create marketplaces that they own and compete on — a conflict of interest that lets them snuff out smaller rivals — like Amazon and Google have done for shopping, search tools, and online ads. They bully cities and states into showering them with massive taxpayer handouts — and spend the profits they get from being the only game in town to lobby and rig the rules even further in their favor. They even scare investors away from funding new startups — because what’s the use in going up against a giant corporation that’ll just snap you up or drive you out of business? We’ve got to call it out. And we’ve got to do something about it. So today, I’m proposing a new plan to break up the biggest tech companies and make sure these corporations don’t get so powerful that they undermine our democracy. There’s a long history in America of breaking up companies if they have too much power in the marketplace: Standard Oil, AT&T, and the railroad industry led to the bipartisan creation of our first antitrust laws. What I’m proposing is right in line with our country’s history — and it’s a big part of what has allowed our economy to grow and new companies to thrive. Here’s what will change: Small businesses would have a fair shot to sell their products on Amazon without the fear of Amazon pushing them out of business. Google couldn’t smother competitors by demoting their products on Google Search. Facebook would face real pressure from Instagram and WhatsApp to improve their user experience and protect our privacy. Tech entrepreneurs would have a fighting chance to compete against the tech giants. This is how we’ll make sure we get more competition and more new ideas in the tech economy, instead of just a few giant tech companies calling all the shots — and regular people not having much say in the tools we use everyday. That’s how we get innovation. That’s how we get an internet that does a better and better job of letting us stay connected with each other — from pictures of grandkids to emails and petitions like this one. That’s how we protect our privacy in a rapidly changing world. We can get this done. We can make big, structural change. But it’s going to take a grassroots movement, and it starts right now. Senator Elizabeth Warren, official photo. This morning, Elizabeth announced her new plan to break up the big tech companies like Amazon, Google, and Facebook. Sign the petition to support Elizabeth’s plan to break up the biggest tech companies that run the internet. That way, we’ll get more competition, more innovation, and a better internet for all of us. But it’s going to take a grassroots movement to make this kind of big, structural change. If we’re going to rebuild the middle class, then we’ve got to ensure competition in one of our country’s biggest and fastest-growing industries and a fighting chance for up-and-coming innovators. If we’re going to save our democracy, then we’ve got to make sure these corporations don’t get so powerful that they undermine it. Elizabeth has spent her career fighting to level the playing field for working families. So when she says she’s in this fight to take on the powerful corporations that are rigging the system, she means business — whether it’s big banks, big Pharma, or big tech companies. Let’s send a message loud and clear: No corporation — not even Amazon, Google, or Facebook — should be so powerful that they bend cities and states to their will, or so big that they’re exempt from antitrust laws. We’d note one more point – linked above – for those from the Warren camp. That linked rundown on the Value Penguin site rounds out how her campaign (or any other), renters, and manufactured housing could find political alignment. Good public policy is nonpartisan. As we’ve been saying for years, on all things and all people, it’s about separating wheat from chaff. We would concur with Warren that there is strong evidence that the system is rigged. Ponder how Warren, Bernie Sanders, and Donald Trump have all complained during their campaigns about the rigged system. We see the evidence that manufactured housing was rigged. That rigging has arguably cost manufactured home owners more equity. That rigging has cost millions of renters the opportunity to own. That rigging of the system has harmed the interests of thousands of manufactured housing independents. Longtime readers know we’ve made that case. Clayton Homes, 2003. After the Buffett Berkshire Buyout. Dialogue with the Warren campaign, or any other campaign that sees the value of two potentially large and often overlooked voting blocks, could bridge the gap on other issues where we do not yet see eye-to-eye. 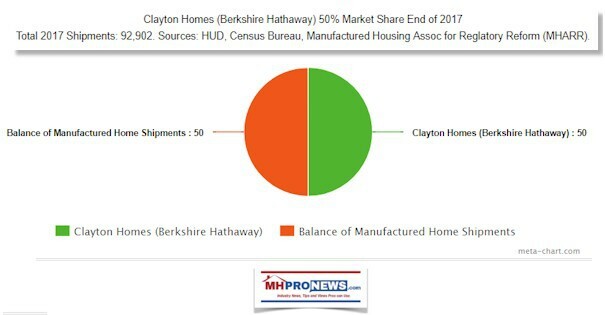 While several allegations of monopolistic practices have been made against Clayton Homes and Berkshire Hathaway, this website and MHLivingNews are the only ones to date that is known to have produced evidence, and provided to date this kind of logical, relevant data. Antitrust advocates will need proof, not just hot air. Evidence of how they rigged the system taken straight form their own documents and words are linked here. What is certain is that Warren, if she wants to beat Senators Bernie Sanders, Kamala Harris, Cory Booker, former VP Joe Biden or others, will have to set herself apart in a way that connects. She will need even more energy. We will naturally stay in touch with the White House, Team Trump, and others too. Sign Up for our headline email news updates Today!